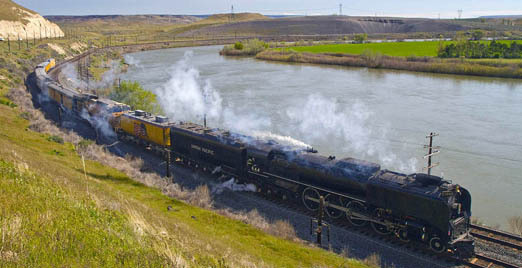 Historic Union Pacific steam engine 844 will visit Boise Saturday night and Sunday. The GUARDIAN joined some old-time steam engine buffs to make these photos near Glens Ferry Saturday. It was built in 1944, before diesel replaced steam power. The locomotive never officially retired and has been part of the Union Pacific inventory for 73 years. The historic locomotive is based in Cheyenne, Wyo., and will pull into the Boise Depot around 5 p.m. Saturday on a run called the “Boise Turn Special.” Sunday, April 23 — will mark the 92nd anniversary of the iconic depot. We can only presume the Depot will be open for visitors Sunday. Since the city of Boise purchased the historic Spanish mission-style station it has been closed to the public most of the time except for special occasions and rentals. Fun Facts: Since the City of Boise owns the line east of of the airport and to the Orchard Junction the 844 has to come to Nampa (track to the east maybe unsafe?) before going to Boise. 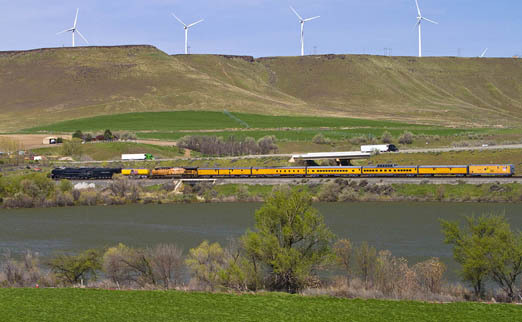 The engineer’s backed the 844 special from the Orchard Junction to Nampa and then will back the train to Nampa to return to Cheyenne WY. This makes the second trip for 844 since the overhaul of the boiler at the Cheyenne Yard.